The new Chicago History Museum. After some work by Hammond Beeby Rupert Ainge it’s looking more inviting. A curving wooden staircase (below) rather than a severe gridded box in the place makes the entrance more inviting. 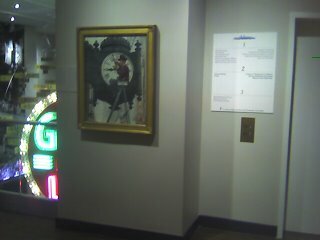 One misstep, on the part of the installers is the placement of Norman Rockwell’s painting of man setting the clock on Marshall Field’s. 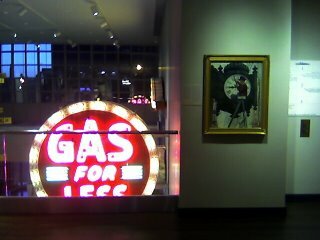 The good-to-look-at work is next to an elevator door, but even worse, it’s by that “Gas for Less” sign that flashes and changes colors. So you really can’t see the painting, and it’s made to seem not very valuable anyway, hung on a column near an elevator. I’m not the biggest Norman Rockwell fan, but if you want to talk money “Clock Mender” is said to be worth $ 2-3 mil. I know the History Museum got this painting after designing their new installations, and I think it was a surprise the work went to them. Remember, the Sun-Times reported that Marshall Field’s had the painting, and that Target, which once owned Field’s may have sent it to their headquarters in Minnesota. Last April, Federated, new owner of what was Field’s, demanded the return of the painting. And it did come back to Our Town, somewhat unexpectedly. Only a couple of months ago, Target offered it to the Chicago Historical Society/History Museum. So they’ll find a better place to hang it, I’m sure. was Grant Wood’s American Gothic, newly re-installed in the Art Institute. For such an iconic work it is unprotected, doesn’t have enough space around it, and is simply in the middle of a wide wall. it seems the Art Institute doesn’t understand what a great work it has. And, back to $moolah, if you make the painting seem a little more important, more tourists will flock to it for what they’ll consider a unique experience. I only say this because it is a truly great modern painting. Unlike the Rockwell which is but a fine illustration. What do you think is the most poorly installed painting in Chicagoland? One of the best is Anselm Kiefer in the entrance to the Smart Museum. Lit from above. 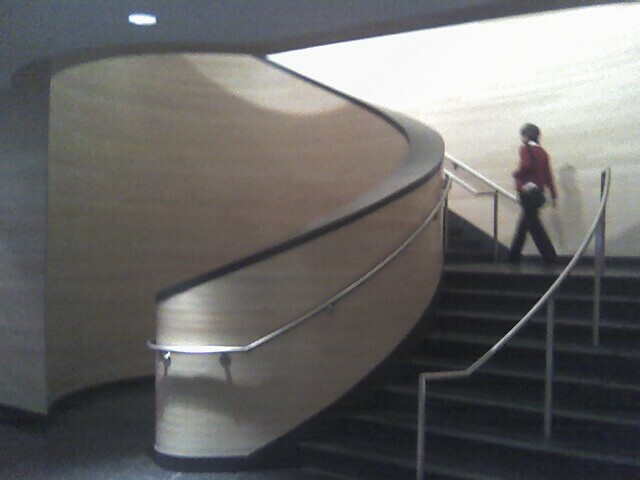 and that shot of the new Guggenheim-esque winding staircase in the new Chicago History Museum. It’s a good way to get you up to the second floor. One more note – as this Sun-Times story tells us, the Chicago History Museum owns another Norman Rockwell painting – of Mrs. O’Leary and her cow. And that one isn’t even on view. Why not? I’d like to see the two works together. You are currently browsing the archives for the 16535036 category.